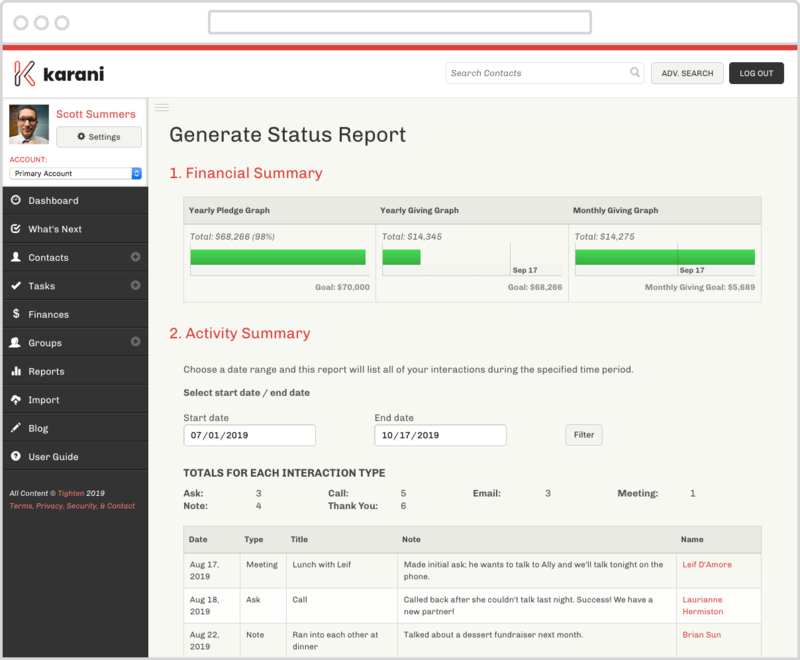 Stay organized, Track your finances, and build better relationships using Karani. Give your contacts the attention they deserve. 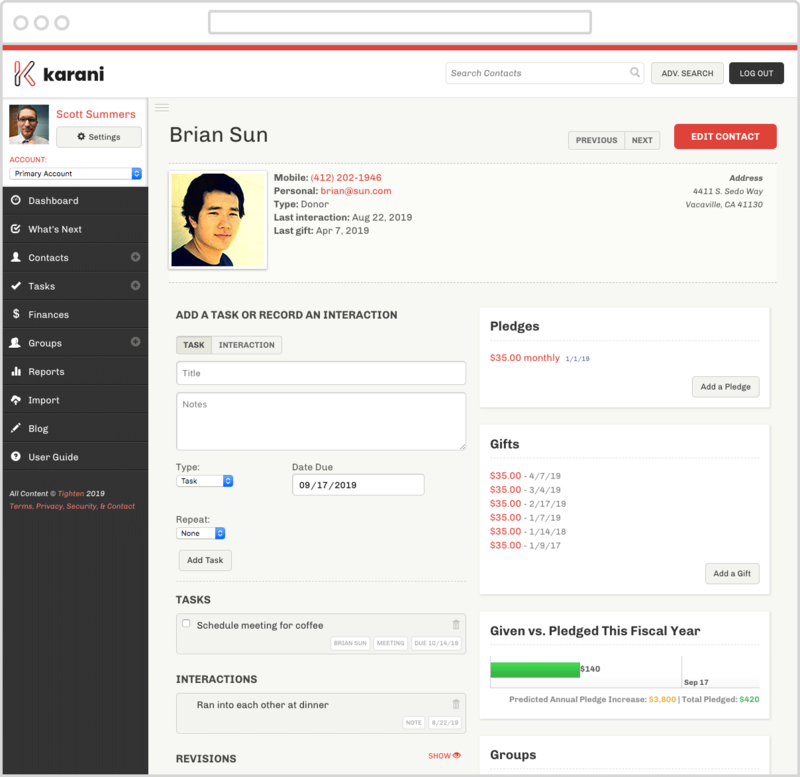 Karani helps you build better relationships with your contacts. Each person and organization in your network gets their own unique profile where you store their contact information, track your interactions, see their pledge and giving history, and create tasks to stay in touch. Karani is helping me get more organized for fundraising than I've ever been before. I used to have several different tools cobbled together into one system - though not very well. Now that my contacts, tasks, and gifts are consolidated in Karani, I'm communicating with partners and potential donors much more easily and regularly. See your fundraising world all in one place. 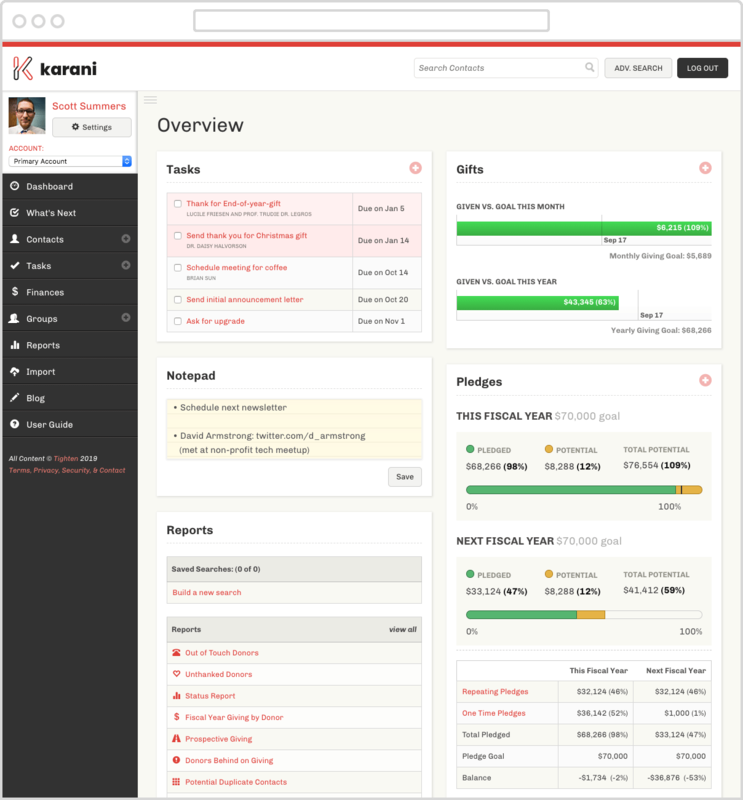 The Karani dashboard shows an overview of your tasks, gifts, pledges, groups, contacts, and reports. Keep the bigger picture in mind as you make calls, set up meetings, write email updates, and get fundraising done. I love how organized Karani allows me to be in fundraising. I have everything I need in one convenient place! Gain insights for smarter fundraising. Karani's reports give you a wealth of information right at your fingertips. Find all of your active donors who live in Denver and love chocolate with advanced search and custom reports. Access pre-made reports to view your entire interaction history, see donors you haven't thanked, or know who's behind on giving. Simple, intuitive, easy-to-use, and great for coaching.